The wisdom and biblical teachings of the early Lutheran Church have been locked away in German and Latin for centuries. 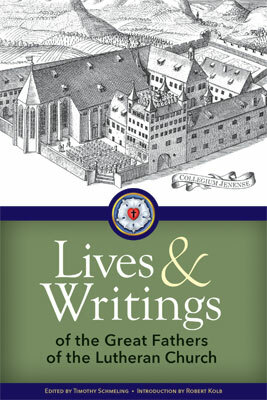 But coming soon from Concordia Publishing House, Lives and Writings of the Great Fathers of the Lutheran Church provides a key to this treasure chest by introducing the chief confessional Lutheran theologians from the era of Lutheran Orthodoxy (1580–1700). Short biographical sketches reveal the little-known life stories of these pastors and theologians, while selections of their best writings are presented in first-time English translations. Each chapter also lists all English translations of their work, along with their greatest writings in the original languages. To find out more about this volume, we interviewed the editor, Rev. Dr. Timothy Schmeling. Read our Q&A with him below. How were the individuals discussed in this volume selected for inclusion? When one thinks of the major figures of Lutheran Orthodoxy, university professors are often the first to come to mind. To be sure, theology professors such as Aegidius Hunnius, Johann Gerhard, and Abraham Calov were great luminaries of the age, but Lives and Writings of the Great Fathers of the Lutheran Church seeks to provide a broader vision of the period. For this reason, not only were exegetes, systematicians, and casuists selected for inclusion, but also devotional writers, editors, catechists, hymnwriters, deacons, pastors, superintendents, and bishops from both the German and Scandinavian Lutheran traditions. The various “pigeonholes” in which these authors might be slotted—theologian, pastor, casuist, hymnwriter—encompass various educational and professional backgrounds, as well as different ties to the Church. What are the elements in the lives of these individuals that unite them as “Fathers of the Lutheran Church”? In the wake of the late Reformation’s crisis and divisions, these adherents of the Augsburg Confession were united in the concrete cultivation of a church grounded in Sacred Scripture and the Lutheran Confessions. At the heart and core of this body of doctrine was justification by faith alone. What do you hope a reader takes away from interacting with these Lutheran Church Fathers, albeit in a brief biography and sample writing? The Orthodox Lutheran Fathers had their faults, but they exemplify what it means to be both catholic and evangelical. They exhibit a penetrating reading of Sacred Scripture and the ability to critically engage worldviews/philosophies. They worked tirelessly to cultivate well-organized churches and fostered the Christian formation of the souls under their pastoral care. What do you find most interesting about the period of Lutheran Orthodoxy and about those who rose to prominence during this period? The theology of the time has often been dismissed as “dead orthodoxy.” It is accused above all else of dogmatizing Scripture and of undermining godliness with a cold, bellicose, and hairsplitting theology. In contrast, this book helps show that orthodox exegesis was hermeneutically informed and sensitive to the historical grammatical context. The dogmaticians strove to show that each doctrinal locus had a practical application. Finally, the orthodox fathers paid far more than lip service to Christian piety; they supported that piety with an expansive devotional literature. Who is your favorite among the individuals discussed in this book and why? Johann Gerhard would be my favorite figure of the age. He is a man of profound wisdom as well as great piety. Gerhard is also the most multifaceted Lutheran of the period. Few could write exemplary works of both doctrinal theology and devotion. In addition, Gerhard would even produce biblical commentaries, patristic studies, study guides, postils, church orders, etc.—all of the highest caliber. Whom did you personally “discover” through the crafting of this volume? I enjoyed getting to know the Scandinavian Orthodox Lutherans such as Jesper Brochmand and Johannes Rudbeckius. I hope that the contributions in this book will help spark even more English-speaking interest and scholarship in Scandinavian, Baltic, and Slavic Lutheranism. If you could provide the translation of one work mentioned in this volume, which would it be and why? What benefit would it have for the Church today? I am struggling to answer this question, because it is difficult to select just one. That said, I think I would suggest Georg Dedekenn’s Treasury of Counsels and Decisions. The collection provides a wide selection of theological opinions on how to properly handle difficult cases of pastoral theology. Since contemporary English-speaking Lutherans tend to know Lutheran Orthodoxy largely through English translations of its dogmatic works, a full translation of this collection would greatly expand our knowledge of the period. By entering into a dialogue with the great orthodox fathers over the proper application of Scripture in the past, it will also help contemporary pastors properly apply God’s Word to the needs of today. What is the ongoing value of interacting with the life stories and with the works of these individuals (whether in the original language or in translation)? One of the Ancient Church Fathers once said that we are pygmies standing on the shoulders of giants. By making the Orthodox Lutheran Fathers and their writings more accessible to English-speaking Lutheranism, contemporary Lutherans can gain a better understanding of who we are and a fuller access to the treasures of our rich tradition. It will supply us with a valuable model for confessional Lutheran engagement with our world as well. Download a free excerpt from Lives and Writings of the Great Fathers of the Lutheran Church.